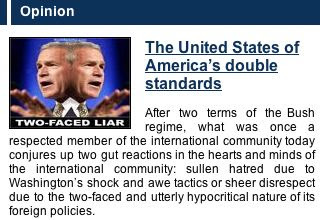 "Russia recognizes South Ossetia and Abkhazia to save people’s lives"
"Bush, Cheney and Rice; Hitler, Himmler and Goebbels"
"Russia’s financial crisis of 1998 plotted by IMF"
"Should People in Democratic Glass Houses Throw Stones?" 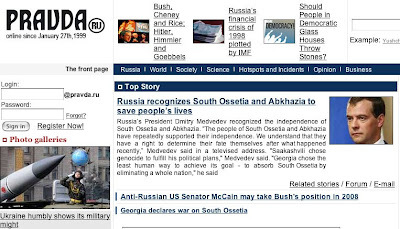 "Anti-Russian US Senator McCain may take Bush's position in 2008"
"Georgia declares war on South Ossetia"
"Ukraine humbly shows its military might"
Therefore it comes as no surprise to see George W. Bush flouting the international law one minute, by recognising the Serbian province of Kosovo as an independent state and then lecturing Russia on how to handle two cases which do have a claim to statehood, namely Abkhazia and South Ossetia. Take about double standards, talk about one two-faced confused son of his mother. How much longer does Washington have to humiliate itself with this sort of charade? How can anyone in Washington be taken seriously if its President can look the camera in the eye and say with apparent conviction that Kosovo can be independent and Abkhazia and South Ossetia cannot? On the world stage: If Kosovo declares independence the EU could recognise it while no-one else does and that could make Russia very angry - towards everyone, so I hope that doesn't happen. Well that hope sounded a little desparate - and so it has turned out to be. The Kosovo independence recognition move by the US and EU countries was antagonistic and a bad precedent. Add the NATO membership and missile basings going on in Poland and Russia's other neighbours and the result is Russian hostility. Now think back to the last serious confrontation with Russia in that area - the Crimean War. I can't see it getting there completely, but things are seriously heading in all the wrong directions right now. Tim, quoting Pravda Online in relation to this matter is the same as quoting The Sun as a source of news from the Western side. Yeah, I'm going to start linking to fox news after this. Paul Buchanan on the Jim Mora show (on that Panel section at 4PM) had the play down. It is about power politics and strategic realignment. No good versus evil, just competing interests.